You'll have to like Wintersun to connect with this. It sounds silly to say that but as this is the band distilled to their basis, you'll have to enjoy their core sound. There is a filmic feel to the music, strings are to the fore, harsh vocals predominate and the chat is in their native Finnish. The sound allows them to calmly deliver these stentorian songs, the crowd are into it too and they want to show us, but the music here is something to be given to us, the gig atmosphere is not to bathe in. 'Sons Of Winter And Stars' unfurls from a little gear crunching to exultant soaring vocals and precise double guitar lines, real artistry, and 'Land Of Snow And Sorrow' drags its heels even more to reveal its beauty. 'Beautiful Death' and 'Time' pull off the trick of being both floaty with hellish, the crowd getting involved and showing their love. 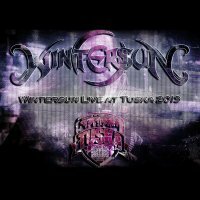 Occasionally this can seem like a template followed, but Wintersun aspire to more than that, this is bigger, filmic and epic, and it's odd that this feels like just another live album, possibly due to the fact that a new studio release is also about; nothing wrong with that of course, but it just feels that the music here, which is so distinct and so singular, should have more ballyhoo around it.